Thanks for shopping at Qspray.com. If you are not satisfied with your purchase, we are here to help. Most orders ship same or next day. Most orders received by 2pm MST are shipped same day. We ship from Phoenix, AZ. We offer Fedex Shipping options and USPS Priority Mail. Alaska, Hawaii & Puerto Rico orders ship via USPS. For international orders, see below. Overnight shipments & orders over $200 require a signature upon delivery. We can waive the signature requirement if you request it in writing, but we don't recommend this because you will be liable for lost or missing packages. If you would like to waive the signature requirement, please contact us. 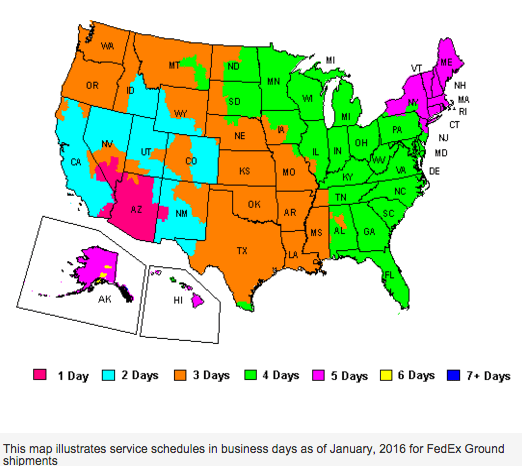 Please consult the map below for estimated Fedex Ground shipping transit times. If you need it sooner, select an express shipping option in the cart. Important: Fedex works on business days (Mon-Fri), not calendar days. Example: If you place a Next Day Air order on Friday, even if it ships on Friday, you will not receive it until the next business day, which is Monday. If Monday is a Fedex Holiday, you will not receive it until Tuesday. If next day is critical to you, please call us BEFORE placing order. See the non-shipping days table below. NOTE: During the holiday season, or when bad weather prevails, packages may be delayed. This is beyond our control. Orders placed on Saturdays, Sundays, and holidays will be shipped the next business day. The Fixed Rate Shipping or Free Shipping offered on select items is for Ground Shipping Only to the lower 48 states. If you want a fixed rate item to go express, please contact us to pay the difference. Our system automatically sends an email with tracking information to all customers who provide a valid e-mail address. If you don’t see the email, check your Spam Folder or contact us. It is the customer’s responsibility to track packages, status and delivery. On the rare occasion that package is not received in a timely manner, customers must contact us within 2 business days after package should have arrived, so that we can file a claim with the carrier. After 3 business days, we will not be able to file a claim on your behalf. Qspray.com is not responsible for lost or stolen packages if we are not notified 2 business days from the date the package(s) should have arrived. First, make a note with the carrier that delivered your package(s). Second, please notify us of any missing items or damaged items. We have to file a claim with the carrier within 3 business days. After 3 business days, we the carrier will not accept the claim and the loss or damage will be your responsibility. Some pesticides cannot be shipped to certain states. Aerosol products can only be shipped Ground Shipping. This means we cannot ship these products to Hawaii or Puerto Rico. Products containing Lithium Batteries can only be shipped Ground Shipping. This means we cannot ship these products to Hawaii or Puerto Rico. Qspray.com has partnered with MyUS.com to offer convenient International Shipping. MyUS.com membership offers deeply discounted international shipping rates to more than 225 countries. They will provide you with a US street address, receive packages on your behalf and then ship your order overseas. MyUS.com also helps prepare customs paperwork for your shipments. Simply sign up with MyUS and get a US shipping address. We ship to that address and MyUS gets your goods to you FAST! Click this link to see how MyUS works. Please note that some items cannot be shipped to international addresses and are not eligible for MyUS.com services. These restrictions include such items as pressurized cans (e.g., aerosol cans) and hazardous materials (e.g., pesticides). Additional restrictions may apply to your destination; the MyUS.com website has a complete list of prohibited items for different countries. 1. Items must be returned in original packaging, in new, saleable condition. 2. We cannot accept returns of items that have been installed or have had chemicals in them. 3. A Return Merchandise Authorization (RMA) is required for all returns. Items returned without an RMA will not be accepted. 4. Please request your RMA within 30 days of purchase. Request a Return Merchandise Authorization (RMA) by e-mailing customerservice@qspray.com or call the Customer Service Manager at . (602) 293-3240. Please provide first & last name, order number, e-mail, reason for return, etc. Please properly pack items in the original packaging. For your protection, we recommend that all returns be sent back by a traceable carrier (such as UPS or FedEx) and that the shipment be insured in case the package is lost. After 30 days, refunds will be made in the form of store credit. Refused and returned items will be inspected to assess condition and resale ability before credit will be issued. Once we receive your return, it takes 1-2 business days to process your return. If we accept your return, most refunds are processed within 2-4 business days after receiving and process your return. In the case of a Manufacturer defect, each manufacturer has its own warranty policy. Please contact us promptly for all manufacturer defects. Manufacturer defects DO NOT cover normal wear and tear or customer negligence. Please notify us within 2 business days of any damage to your products, or if there are any missing parts. We have to file a claim within 3 days with the carrier. After 3 business days the carrier will not accept the claim and the loss becomes the customer’s problem.